An Austin classic, nothing beats plunging into the refreshing 68-degree natural springs and sprawling out on the surrounding grassy hills for a lazy afternoon. Don&apos;t miss: free Saturday 10 a.m. yoga classes beginning in May. Amy&apos;s is a Texas household name. There are more than 350 flavors in rotation, including their famous Mexican vanilla, amaretto cheesecake, chocolate pretzelnut and so many other creations that will blow your mind. Music and movies on the lawn! Favorites like "Dazed and Confused" play after sunset with live music from local musicians at this free and very popular event (show up early!) on the Long Center&apos;s City Terrace. 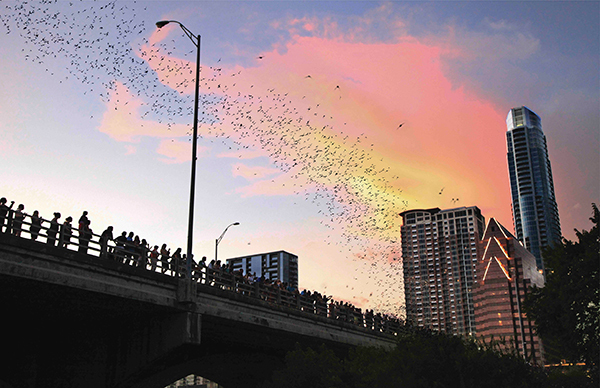 Follow the crowds to the Ann Richards Congress Avenue Bridge nightly, from March through October, and watch nature&apos;s awesome show as more than 1 million bats take flight. Summer sunsets are even more amazing at the Oasis on Lake Travis. Nosh on American and Tex-Mex eats and sip margs on the giant waterfront decks. Bike and hike miles of trails at this south Austin park. Have a picnic or camp out, but be sure to visit the waterfalls and dip into the swimming hole. Kids love Zilker Park&apos;s laid-back mini train. The leisurely ride takes them around the park and Lady Bird Lake on a 25-minute ride. A warm summer evening of putt-putt is timeless and Peter Pan has been serving it up since 1946. Enjoy the two 18-hole courses&apos; fresh makeovers and new obstacles. The former Austin Children&apos;s Museum boasts 40,000 square feet of interactive exhibits showcasing science, technology, engineering, art and math. It&apos;s educational fun at its finest. Experience the longest zipline in Texas (and ninth longest in the world) on a three-hour adventure. Afterwards, play and swim at the private lakefront park. Ask about their night flights. Rent a stand-up paddleboard and get out on Lady Bird Lake. Not sure you&apos;re into it? Check out SUP ATX&apos;s free Sunday morning and Thursday evening demos where you can try it for a free hour. Long Center City Terrace is the place to be on Sunday evenings. Celebrating more than 10 annual summer seasons, various ensembles from the Austin Symphony perform alfresco for free. Another free summer outdoor concert series not to be missed, 93.3 KGSR&apos;s brings all-ages shows to the outdoor stage at Shady Grove on Thursdays beginning in April and running through September. Pick your own strawberries, blackberries and peaches at this expansive family-friendly farm. The kiddos can feed the goats and see the horses. Don&apos;t forget to try a homemade strawberry popsicle. The state&apos;s oldest public pool celebrates 100 years in 2015. Join the party and splash around the wading pool, swim laps and take in a poolside movie this summer. Loop Lady Bird Lake on the new 10-mile trail with the Austin skyline as a backdrop and waterfront views accompanying your stroll along the boardwalk. Visit the Contemporary Austin&apos;s Laguna Gloria for a true art-in-nature experience. Outdoor installations, including impressive sculptures, by leading artists wow guests. Host of the Formula 1 United States Grand Prix, the southeast Austin facility also welcomes an exciting lineup of big name acts every summer at the Austin360 Amphitheater along with MotoGP, Rallycross and more racing action. Take a long lunch or plan a linger-worthy brunch with friends this summer. There are so many scrumptious menus served alfresco, fresh-air feasting is an absolute must. Check out Foursquare&apos;s list of deliciousness: Tastes That Make the City: Austin. The Foursquare team took a look at searches and tips and pulled out trending Austin bites. Download the city guide app and add the 50 must-see experiences to your summer menu, then see how many you can cross off. It&apos;s a pretty tasty challenge. Hashtag your #TopTastes on our Twitter page and we&apos;ll compare notes!